A 330-metric ton boat crane will be used at a planned maintenance shed, part of the Canal Landing marine complex on West Commercial Street. 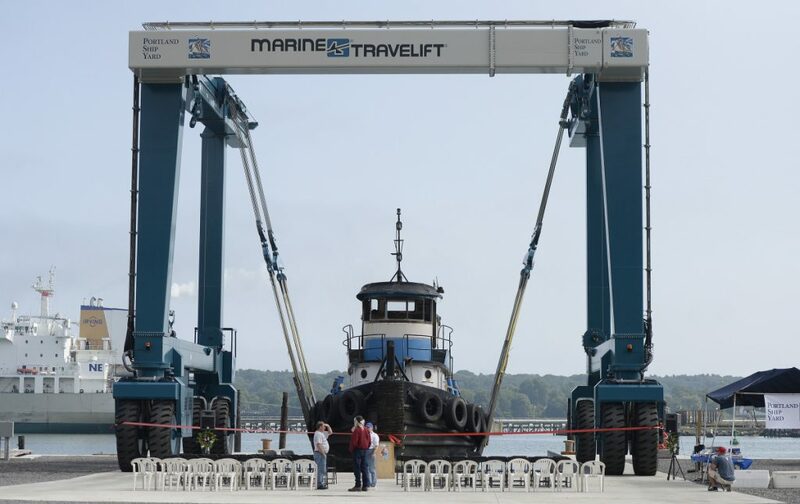 A huge, 330-metric-ton boat lift was unveiled on Portland’s western waterfront Tuesday, signaling the next phase in the industrial redevelopment of prime marine real estate. Portland Shipyard and Portland Yacht Services initiated service of the travel lift during an afternoon ceremony. The lift, which hoists large boats out of the water and moves them to workshops on land, is crucial to a plan to develop a boat- and ship-repair complex on a vacant rail yard. The lift is the latest development for the Canal Landing marine complex at 400 West Commercial St., between the Casco Bay Bridge and the Sprague Energy Terminal. A total build-out will include three new buildings, reconstructed piers, equipment, boat storage and parking space on an 18-acre parcel. In total, the development will cost around $17 million, Sprague said. 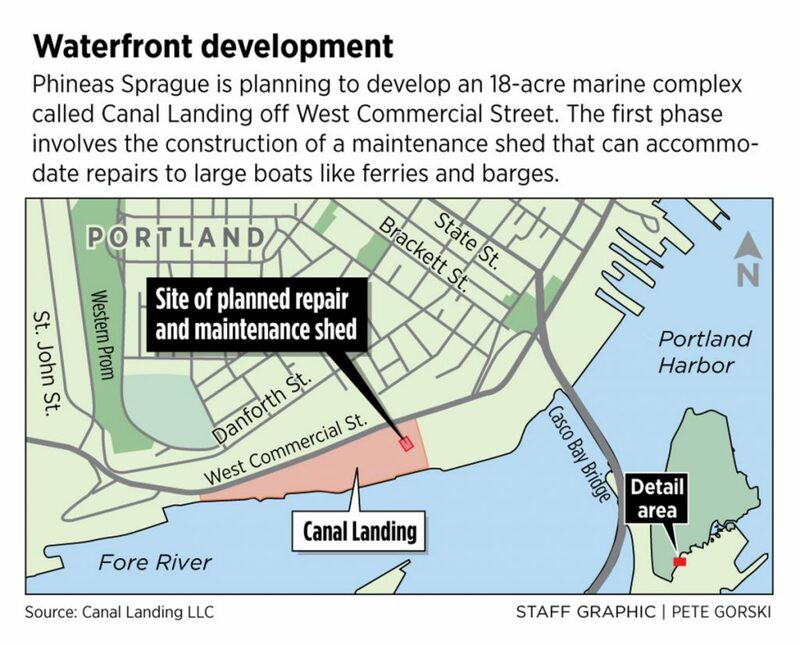 Tuesday’s event coincided with the start of Portland Planning Board’s consideration of a 72-foot-tall boat maintenance building Sprague has proposed as part of the waterfront complex. The 12,000-square-foot shed is intended for large vessels such as ferries, barges and fishing boats, Sprague said. Portland currently has no facility to maintain and repair larger boats, he added. At 72 feet tall, the building nearly reaches the maximum height allowed under updated zoning rules for Portland’s waterfront port development zone approved last year. Zoning changes were intended to improve and update the industrial waterfront area, including a huge cold-storage warehouse and Sprague’s planned marine complex. “This would not have been possible without the zoning change,” Portland Economic Development Director Greg Mitchell said during the ribbon-cutting for the boat lift Tuesday. Increasing height limits – a maximum of 75 feet for marine-related businesses – was a major issue for residents in the West End who opposed the construction of a 68-foot-tall warehouse on the waterfront. The cold-storage warehouse that was proposed three years ago is not currently being pursued, but the Maine Port Authority has said it plans to build some cold-storage capacity near Sprague’s property. Sprague doesn’t expect opposition to the proposed maintenance building. Neighbors support the project and it won’t obstruct views because it is smaller and perpendicular to their line of sight, he said. “We’re doing what the public has demanded from the zoning, we feel like we have incredible support from the city and the neighborhood,” he said. Sprague hopes to start construction on the maintenance facility as soon as possible. Construction of two other buildings, a multistory office building and 19,800-square-foot marine retail and maintenance building will be delayed until this fall because of a backlog at the steel manufacturer. The Canal Landing project is a culmination of Sprague’s long-held vision for Portland’s waterfront. The proposal is a little “frightening” because he sank his entire retirement in the endeavor.